Escrito por TakemebackTeam on 15 de Marzo de 2016 en Newspapers. As one of the world’s largest newspapers and the “newspaper of record” for the United States, the New York Times can be one of the best places to search for archival material. The Times was often at the forefront of national and international reporting and has received 117 Pulitzer Prizes, the most of any news organization. The original Times, then called the New-York Daily Times, dates back to 1851. The hyphen was dropped in 1896 when the newspaper was purchased by Adolph S. Ochs. Ochs also coined the paper’s motto, “All The News That’s Fit To Print”. The Ochs-Sulzberger family still owns the publication, with Arthur O. Sulzberger, Jr. currently serving as Publisher and Chairman of The New York Times Company. In addition to publishing in New York, the paper also began offering a national edition in 1980. Originally these were published in Chicago, then delivered by trucks and planes around the country, but later printers were spread around the nation. A western edition, featuring focus on California and other western states, was twice attempted but was unsuccessful. An international edition was published for almost 20 years by the Times before merging with the Herald Tribune and the Washington Post in 1967 to publish the International Herald Tribune. 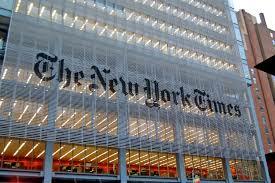 The New York Times became the sole owner in 2003. While western, national and international editions were never as successful as the main publication, the Times was among the first newspapers to establish an online presence. America Online carried @times beginning in 1994, and nytimes.com went live in 1996. The Times currently offers many digital components including social media and apps on multiple platforms. In 2015 the Times passed one million online subscribers to become the 3rd largest metropolitan newspaper in the United States. In 1863 draft protesters attack the Times building. Raymond and other staffers defended the building with rifles and a Gatling gun. The protesters moved on and attack the Tribune building instead. The famed New York Times crossword begins in 1950. During a power blackout in 1965 the Times used the Newark Evening News’ presses. The following morning, the Times was the only New York paper that had been printed. The New York Times offers access to archived copies or back issues of its newspapers online. The availability , format, and cost varies by year. Papers from 1851-1922 are free online with no restrictions or limitations. Copies from 1923-1980 can be purchased individually or are free with a paid digital subscription to the New York Times. Copies from 1981-present are available to view online. Paid subscribers have unlimited access, nonsubscribers can view 10 per month at no charge. Paid subscribers also have unlimited access to Times Machine, featuring digital reproductions of papers from 1851-1980, including photographs. Previews are available for all articles, regardless of year, which is useful since there are no refunds available for purchased articles. Prior to 1981 classified ads are not available in the archives. After 1981 photographs, advertisements and illustrations may not be displayed, but these can be purchased individually. The New York Times is by far the most famous newspaper published in New York but many other newspapers were published in this city: if you're looking for any other New York newspaper archives have a look here.